We offer Donna Bella micro beaded or tape in, human hair extensions in several lengths and multiple colors. Our specialist has years of her own experience in the hair industry, and has worked with extensions on a regular basis for her entire career. She specializes in properly placed and colored, extensions. Learning your unique and creative application is her forte. We bring years of experience back to you for that perfect look accommodating all of your styling needs. Come in for a complimentry consultation. Hair extensions are positioned carefully and strategically around your head, to ensure that they remain undetectable and blend with your natural hair. An inch gap is left around the hairline, so that you can wear your hair up with no extensions showing. Bonds are placed approximately 1cm from the scalp and sit completely flat to the head, enabling your own hair to continue growing freely and move naturally. Hair extensions are extremely versatile and can be applied to most hair types. They can even be applied to fine hair and still remain undetectable. 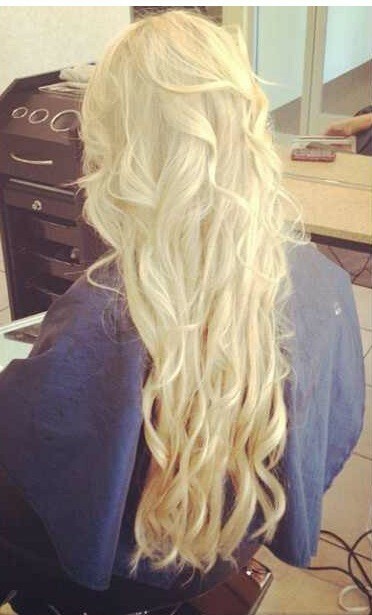 Whatever your hair type, our design of hair extensions will always look natural, as though it was your own real hair. 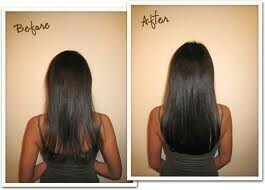 Once the application is finished, the hair extensions are cut to carefully blend with you own hair. Then it's styled it for a natural look. Each strand is very fine and is attached to an equal section of the natural hair based on a weight for weight ratio. This makes each hair extension very light, and avoids overloading & stressing the natural hair with too much weight. This prevents causing tension on the root of the hair. 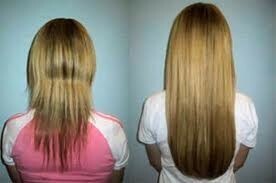 Hair extensions should never damage your hair with correct application and proper home care. PRICES: All prices are based on individual factors. Consults are FREE! We do our best to work with most budgets, to provide you with the hair of your dreams! A consultation is required for any new client extension service.